The Under Secretary for Political Affairs is currently the third ranking position in the United States Department of State, after the Secretary and the Deputy Secretary. While the positions of Secretary and Deputy Secretary are occupied by political appointees, the position of Under Secretary of State for Political Affairs is usually (but not always) occupied by a career Foreign Service Officer, making the occupant the highest-ranking member of the Foreign Service. 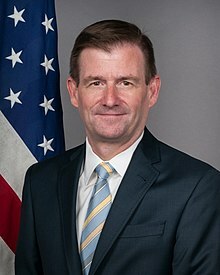 The current Under Secretary is David Hale, who assumed office on August 30, 2018. The Under Secretary serves as the day-to-day manager of overall regional and bilateral policy issues, and oversees the bureaus for Africa, East Asia and the Pacific, Europe and Eurasia, the Near East, South and Central Asia, the Western Hemisphere, and International Organizations. The Under Secretary is advised by Assistant Secretaries of the geographic bureaus, who guide U.S. diplomatic missions within their regional jurisdiction. The political bureaus were first overseen in 1949 by a "Deputy Under Secretary for Political Affairs". Prior to the creation of the position of Under Secretary of State for Political Affairs in August 1959, the Deputy Under Secretary for Political Affairs assisted the Secretary and Under Secretary of State in the formulation and conduct of U.S. foreign policy. After August 1959, the Deputy Under Secretary for Political Affairs served as a focal point for interdepartmental relations, especially those dealing with politico-military issues. During 1969, the Department discontinued the position and created a new Bureau for Politico-Military Affairs, which exists today as the Bureau of Political-Military Affairs under another Under Secretary. ^ "1 FAM 041 Under Secretary for Political Affairs (P)". Foreign Affairs Manual. U.S. Department of State. January 31, 2017. Retrieved March 28, 2018. ^ "Pay & Leave: Salaries & Wages". Salary Table No. 2015-EX. United States Office of Personnel Management. January 1, 2015. Retrieved January 4, 2016. ^ "Senior Officials". U. S. Department of State. ^ "Hale, David". U.S. Department of State. U.S. Government Publishing Office. Retrieved August 30, 2018. ^ "Under Secretary for Political Affairs". Retrieved September 20, 2007. ^ "History of the U.S. Department of State". Retrieved September 20, 2007. ^ a b "Under Secretaries of State for Political Affairs". Retrieved September 20, 2007. ^ "Biography, Wendy R. Sherman, Under Secretary, Political Affairs". United States Department of State. Retrieved December 29, 2011. ^ "State Department gets some nominees, after Cruz clears his roadblock". Washington Post. February 12, 2016. This page was last edited on 7 December 2018, at 17:38 (UTC).